February 26, 2011 /142 Comments/in Anti-Semitism, Featured Articles, Policing the Media /by Edmund Connelly, Ph. D.
Alas, the news is that fabulously popular actor Charlie Sheen has been canned or at least suspended from his show Two and a Half Men. Though the show has been CBS and Warner Bros. Television’s top-rated sitcom for the season, Charlie crossed the line: He said something construed as anti-Semitic. In his interview with Jones, Sheen repeatedly evoked violent images and ideas. He also derided [Two and a Half Men producer Chuck] Lorre in an attack that reeked of anti-Semitism. “There’s something this side of deplorable that a certain Chaim Levine — yeah, that’s Chuck’s real name — mistook this rock star for his own selfish exit strategy, bro. Check it, Alex: I embarrassed him in front of his children and the world by healing at a pace that his unevolved mind cannot process,” Sheen said. It’s okay to say Jews are smart. That will get you major media coverage. But implying something negative about Jews in general is definitely going to bring out the heavy artillery at the ADL. Indeed, the confluence of Sheen’s private life and his TV persona makes him a very effective contemporary icon for dissolute sexual behavior and lack of interest in family and children by young males—the decades-long Hollywood campaign for cultural dissolution. It’s a good example of the general point that the cultural values of the people who script what actors like Sheen portray are dramatically out of sync with the values of most Americans and even more so with traditional American culture. “The elite was [since the 1960s] and remains disproportionately anti-Establishment in its social and political views and . . . remains so even as a large segment of the American public continues to be ambivalent, or opposed to the new social paradigms” (Powers et al. 1996, 48). Moreover, the social and political messages emanating from Hollywood have been impervious to election returns, and “if anything, the ascendance of conservative politics in Washington may have accelerated television’s leftward tendencies by alarming and mobilizing the predominantly liberal Hollywood community” (Lichter et al. 1994, 418). Lorre-Levine’s Two and a Half Men certainly fits this pattern. While Sheen’s behavior is well known, Lorre-Levine is said to have an “acerbic personality” and a long history of not getting along with the people he works with—reminiscent of the portrayal of aggressive, acerbic, and massively egotistical Jewish Hollywood executives in Barton Fink. One would love to hear exactly what Sheen had in mind by calling them Nazis and hypocrites. Perhaps that the Hollywood addiction to left-liberal cultural values coincides with displays of Jewish ethnocentrism, Zionism, and superiority to non-Jews—a certainly not uncommon pattern. Haim Saban, pillar of the Democratic Party and fanatic Zionist, comes to mind. In any case, Sheen must have been under the influence of something because it’s inconceivable that anyone in Hollywood now could be unaware of the rules when talking about Jews. Think Marlon Brando, Mel Gibson, Rick Sanchez. 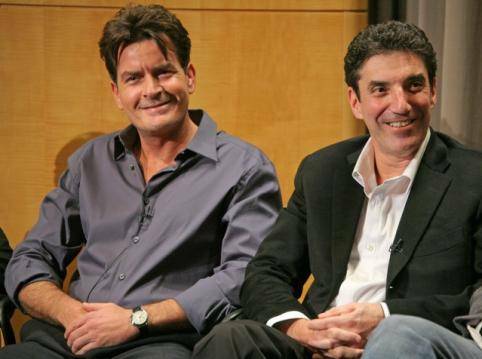 Perhaps as the star of a very lucrative show, he thinks that he is untouchable, but that may not be the case: “Surely Lorre and his writers are clever enough figure out an “Operation: Off the Rails” story line in which a vibrant and distracting new character is introduced mere moments after Sheen’s Charlie Harper has gone on “an unexpected and indefinite trip to Morocco.” Lorre would probably script a painful and humiliating screen death for his nemesis. Joseph Sobran famously wrote that Jewish power is unique “in being off-limits to normal criticism,” and that “Survival in public life requires that you know all about it, but never refer to it. A hypocritical etiquette forces us to pretend that the Jews are powerless victims; and if you don’t respect their victimhood, they’ll destroy you” (see here, p. 55). Same old, same old, I guess.